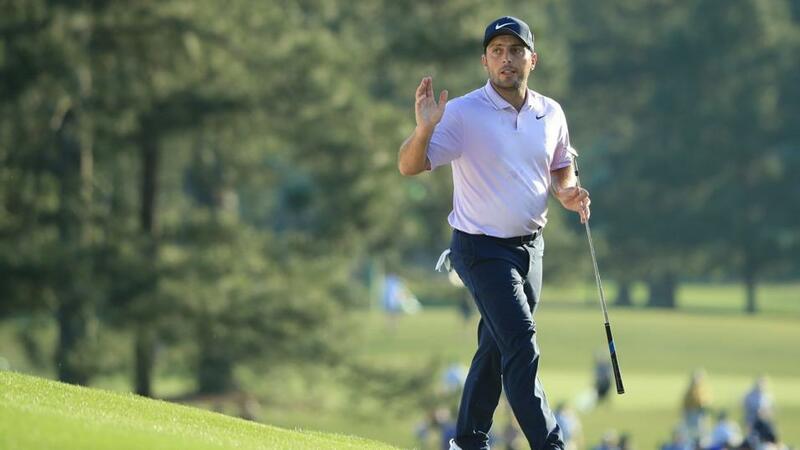 "The manner in which Molinari constructed yesterday’s six-under-par 66 was impressive in the extreme and he’s playing even better than he did when he won the Open last summer. He hasn’t made a bogey since a solitary one on Thursday and to put that in to context, no Masters winner has ever made any less than five throughout the week. With the prospect of severe weather arriving in the Augusta area later today, for the first time since the 1970s, the committee have chosen to send the players out early at the US Masters today in groups of three, with a two-tee start, and the final three-ball will begin their final round at the first hole at 14:20 UK time. Here's the 54-hole leaderboard with prices to back at 10:20. With the course set up kindly, low scores were prevalent yesterday and we saw 15 rounds of 68 or lower and we even witnessed three 64s - from Patrick Cantlay, Webb Simpson and Tony Finau. Prior to this year's renewal, there'd only ever been two rounds of 64 or better in the entire history of the championship, stretching all the way back to 1934. It's going to be a very different story today though. The course set up won't be so generous and the wind is forecasted to pick up. Since Nick Faldo claimed the first of his three Green Jackets, fully 30 years ago, when he won from tied ninth and five adrift, no winner has been outside the top five places with a round to go and the vast majority have sat first or second. Only five of the of the 29 winners since 1989 haven't sat first of second and although Faldo won his third title from six adrift in 1996 and Charl Schwartzel trailed by four in 2011, they were both second with a round to go and won thanks to poor final rounds, from Greg Norman and Rory McIlroy respectively. Every other winner in the last 30 years has been within three of the lead with a round to go. With the prospect of gusting winds and rain, we're a bit in the dark this morning. Forecasts suggest wind speeds of around 15 knots, gusting to up to 30 before the rain arrives in earnest in the afternoon so having moved the tee times forward, we should get done before the rain but the players will be out there during the highest winds. With the field split in two and with the tee times narrowed, I can't really see how a big advantage for anyone could develop and the chances of a closer spoiling what's anticipated to be some party, look extremely remote. Given the stats, I'm dismissing everyone outside the top-five and I'm really struggling to see past the leader. Regular punters might be a bit surprised to see Ian Poulter a shorter price than Webb Simpson given they're on the same score but that makes sense. Simpson's won a US Open and a Players Championship but he has to back up yesterday's low round in very different conditions and Poults may well be better suited to a grind in poor weather. The Englishman has every right to trade lower than Simpson but I'm not keen on the chances of either man. My pre-event pick, Brooks Koepka, is still in with a shout, despite making a number of silly bogeys and despite missing birdie putts on the last three holes yesterday, that all looked like they were going to drop! It's testament to his immense talent that he's still in there punching, having not been at his best for two days, but the stats are against him now and I'm far from confident. Tony Finau's sensational 64 sees him squeeze in to the final three-ball but the market suggests he has less chance than Koepka and I agree. He's yet to impress in-the-mix in ordinary tournaments and his one PGA Tour title to date came at the low-profile Puerto Rico Open three years ago. I really don't fancy him to back up yesterday's heroics from off the pace and I'm more than happy to leave him out. In fact, I was tempted to lay him in the Top 5 Finish market at odds-on but he's a terrific wind exponent and that tempers my enthusiasm. Tiger Woods' charge on the back-nine yesterday evoked all sorts of distant memories and a win for Tiger today would be quite something, and arguably a bigger achievement than Jack Nicklaus' last win here in 1986, but he's not for me. It's now 11 years since he won his last major championship and Father Time is most definitely against him. He may well win, and it would be incredible for the game if he did but I see the early start as a hinderance and I think he's got his work cut out to get by Molinari. The manner in which the Italian constructed yesterday's six-under-par 66 was impressive in the extreme and he's playing even better than he did when he won the Open last summer. He hasn't made a bogey since a solitary one on Thursday and to put that in to context, no Masters winner has ever made any less than five throughout the week. It really is an astonishing performance so far, but he needs to keep going. His price of [2.9] is more than fair and I expect him to get the job done today but it's probably worth remembering the WGC - Match Play two weeks ago, when he looked far and away the most likely winner there too once he reached the semi-finals. Having looked imperious for the first four days in Austin, errors crept in to his game in his semi-final against the eventual winner, Kevin Kisner, and if he boards the bogey bus early on, he might suddenly look vulnerable. I'm not in the least bit convinced by Finau, but if Brooks or Tiger get a whiff of blood, they won't need a second invitation to strike. This has been an education of a Masters for me so far and a bizarrely quiet one - trading wise. I liked the look of Molinari at [30.0] after round one, I thought he looked the value yesterday, and I can't see anything wrong with his price this morning but I've barely got involved. I layed a bit of my Brooks bet back last night and I sided with Molinari at [3.05] but I don't remember a Masters in which I've had so little involvement in-play. I'll maybe reflect on that a bit tomorrow in the De-brief. We've reached the halfway stage of the US Masters and we're faced with the strongest 36-hole leaderboard at any major in many a year - the best I can remember. There are 22 players within four strokes of the lead and that's the most congested the leaderboard's been at Augusta since 2012, when 23 were within four. And it's the second most cluttered ever - back in 1966 and 1947, 20 players were within four of the lead at this stage. Here's the top-10 and ties with prices to back at 10:40. The stats tell us that being in front at this stage is a huge plus - four of the last five winners have been in front at halfway and given only eight winners in the entire history of the US Masters have been outside the top-ten at this stage, there's an argument to be made that we need only concentrate on those listed above. Charl Schwartzel, in 2011, was the last man to win from outside the top-ten through 36 holes and before that it was Jack Nicklaus in 1986. It is worth mentioning how strung out the leaderboards usually are though. For example, ten men have won the US Masters having sat second at this stage but four of them were trailing by four. There are nine players within a stroke this time around and that's unprecedented. Back in 2012, when a record-breaking 23 players were separated by just four strokes, there were still only seven players within one of the lead - held jointly by Fred Couples and Jason Dufner. The eventual playoff protagonists in 2012, Bubba Watson (winner) and Louis Oosthuizen, had been two of the five players tied for third and just one off the lead at halfway, and I fancy we can narrow this year's renewal down to the nine players within one this year. That's really harsh on Jon Rahm and Ian Poulter but both have scored remarkably well given how they've played and with regards to the Spaniard especially, I wonder whether he can continue to keep saving so many strokes. Of the nine players ahead of those two, seven are major champions and one of the two that aren't, Xander Schauffele, is a Tour Championship winner. It's extremely difficult to see all of them failing to produce two strong rounds over the weekend and as close as Poults and Rahm are, they both need something really special to win. So, who's going to produce the two strong rounds to win? Here's my take on the top-nine in reverse order of preference, taking in to account their prices to back this morning. Justin Harding - incredible first US Masters but history is against him and I'd be amazed if he can keep going forward. Xander Schauffele - best round of the week yesterday to put himself in-the-mix but several stats are against him and he's already made five bogeys and a double. Hard to see him backing yesterday's performance up and to keep the errors of his card. Adam Scott - the 2013 winner has had all sorts of woes on the greens for years now so will the putting stand up to the pressure? Looking for his first win in more than three years. Louis Oosthuizen - a regular contender in majors, he's finished second in all four. Won the Open Championship in style when he slipped the field at halfway in 2010. Won his national title in December which has provided a great platform for some nice form but incredibly, still yet to win on American soil. Tiger Woods - what a story it would be if he were able to become the oldest winner since Jack in '86 but he looks too short to me at [9.0]. Age really is against him and it was noticeable how tired fellow veteran, Phil Mickelson, looked yesterday. Dustin Johnson - clearly taking a more conservative approach and playing very nicely - the world number two has made just two bogeys so far this week and it was his inability to remain focused that worried me most before the off. Can he continue to play largely error-free or will we witness the usual lapse of concentration? That's enough of a concern for me. But only just. Jason Day - yet again we have to witness the charade of Day needing treatment during play before he then whacks every tee-shot effortlessly. It's irritating to see and I largely ignore it but we can't get away from his figures. So far this week, Day's putting superbly and he's scoring well on the par fives. His price looks fair to me. Brooks Koepka - touched [4.4] when he birdied the first hole to lead alone yesterday but lost the plot a bit after that. A double-bogey at the second stopped him in his tracks and the par putt miss on the fourth from what looked little more than a foot has to be seen to be believed. Has he had his bad round though? Recovered nicely after another bogey at the sixth when many a player would have folded like a cheap suit and still a very likely winner. In summary, other than a small and disastrous bet on Bryson DeChambeau early yesterday, I'm still playing the waiting game. This year's renewal hasn't panned out like many before it and it's just too tough to call still. Not that I'm complaining for a single second, if you're not salivating at the prospect of watching this tournament develop this evening then golf really isn't for you. If you haven't had a bet yet and you want an involvement, Molinari on the exchange or each-way looks my idea of the best bet but I'm more than happy to watch and wait myself. A combination of drier than expected fairways, blustery conditions and some tricky pin positions resulted in a bunched leaderboard for much of the first day of the 2019 US Masters, with nobody bettering a three-under-par 69, but as so often happens on day one at Augusta, a number of late afternoon starters caught fire to pass the early leaders. Pre-event fancy, Brooks Koepka, looked like finishing the day in front after he'd birdied five of the first six holes on the back-nine but Bryson DeChambeau birdied six of the last seven, with thanks to a near hole-in-one at 16, a chip-in at 17 and this remarkable approach on the 18th to post a six-under-par 66 to catch Koepka. Playing in the penultimate group and in the three-ball behind DeChambeau, Phil Mickelson then got to within one after birdies at five of the last seven holes and Koepka, the only man to go bogey-free, will have felt he should have ended the day in front. He left his ten-foot birdie at 16 in the jaws and missed an eight-footer for birdie at the last so he only parred in after the 15th to tie Bryson at the top. It was some finish! Although Phil, Bryson and Brooks kicked on at the end, it's still a congested enough leaderboard with 28 players under-par and here's the top ten with prices to back at 10:30. The last 13 winners have all been inside the top-ten after round one and since Mark O'Meara won in 1998, having trailed by five strokes in a tie for 25th after the opening day's play, only Tiger Woods and Phil Mickelson have won from outside the top-ten places. Tiger was miles back in 2005 - tied for 33rd and trailing by seven - but every winner since, bar Sergio Garcia two years ago, has been within four strokes of the lead after round one so that eliminates everyone tied for 21st on -1 or anyone further adrift. It's clearly not easy to come from off the pace here now and it's also worth noting that although Garcia trailed by six, he was right on the premises anyway. Charley Hoffman had led the field by four after a sensational 64 to kick the event off and Garcia was only tied for fourth, but if you really want to make sure you're narrowing the field down correctly, according to Justin Ray's tweet below, you can probably safely discount everyone that shot over the par of 72 yesterday. Field average was 72.87 today. No Masters champion has ever shot worse than the field scoring average in round one. That really is food for thought if you're considering backing Patrick Reed to make a successful defence, Sergio Garcia to win a second Green Jacket, or more pertinently perhaps, either Justin Thomas or pre-event favourite, Rory McIlroy, to win. Having backed both Koepka and Mickelson at juicy prices before the off, I'm delighted by the start but as always, there's a nagging regret or two. I probably should have sided with Bryson DeChambeau at more than twice the price he traded at a couple of months ago (drifted from around [20.0] to almost [50.0]) on the same principle that I played the over-priced but extremely classy Koepka. DeChambeau had gone off the boil slightly but 20th in the Players in his penultimate start was a decent enough effort and he's extremely prolific. The world number six is looking for his sixth win in just 22 starts! And if I'm really going nitpick, I'm a little worried Koepka will finish up regretting three-putting the par five eighth and missing the two very makeable birdies at 16 and 18. DeChambeau is top of my list of possible in-play bets, followed closely by Jon Rahm and Francesco Molinari but I'm going to leave the event alone for now. I obviously fear Dustin Johnson but he only made one bogey all day yesterday and I'd be very surprised if he maintains that level of scorecard neatness. As highlighted in the preview, DJ has a habit of throwing in too many errors here and for that reason he looks a fraction short to me this morning. I'm leaving DeChambeau out for now because I just wonder if his game is quite up to scratch enough to keep going for four days. He only ranks 57th for Driving Accuracy and 37th for Greens In Regulation so far and how much did that crazy finish tidy everything up? I see Paul Krishnamurty has now sided with Jon Rahm, who Dave Tindall liked from the outset, and he looks like a massive danger. He finished 27th on debut in 2017 and fourth last year, despite ending round one nine off the lead in a tie for 55th. It's surely only a matter of time before the hugely talented 24-year-old becomes the latest Spaniard to don a Green Jacket but again, it makes sense to hang fire for now. Rahm is one of the last out today and his price is going to shift one way or another, depending on what the early starters do. The top-five on the leaderboard all begin their rounds in the morning and he could find himself a fair way back by the time he begins his round. Conversely, the leaders may largely struggle but there should be ample opportunity to side with Rahm if they do throughout the day. I'm going to be monitoring it closely. The stats suggest Francesco Molinari, who sits in a tied for 11th, has just too much to do but he's playing some lovely golf of late, he's now a major champion, and I'd rather play him at [30.0] than Woods or Rickie Fowler at [19.0] on the same score but again, I'm going to wait and see how the day unfolds. If you've not already discovered it, the official website's scoreboard is absolutely awesome. If you click on the Track arrow next to each player's score, it not only shows where their shots are being played to and from, it also shows videos of every shot played so there's absolutely no excuse not to be on the ball this week and it provides an excellent tool for in-running trading. I'll be back tomorrow with a look at the state of play at halfway.